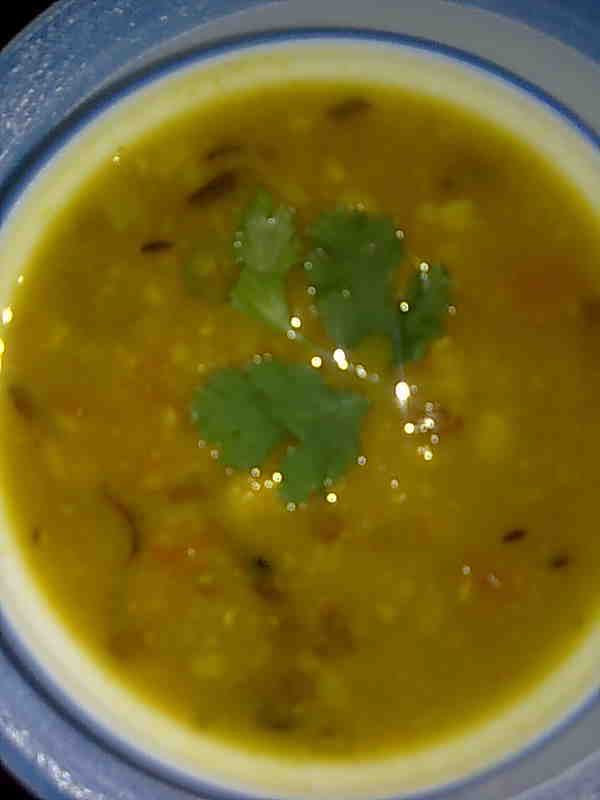 Panchmel dal or panchratni dal comes from the colorful land of Rajasthan. As the name suggests Panch + mel, this dal is a combination of 5 different dals. It’s very nutritious and protein rich. Mix all the above dals and wash them. Soak them for at least 1 hour. Drain and boil them in a pressure cooker with enough water, turmeric powder, salt and half of chopped ginger till cooked. When pressure drops, open cooker and mash the dals with the back of a ladle (karchhi). For tadka, heat ghee in a pan and add cumin seeds. When they change color, add hing, laung, tejpatta and moti ilaichi. Fry for a minute. Add green chilies and remaining ginger. Sauté for a few seconds. Add cumin powder, coriander powder and tomatoes. Cook till tomatoes are soft and pulpy. Immediately add the tadka to the boiled dal and cover. Let the simmering spices seep through the dal. Let the dal simmer on low heat for 5 minutes. Garnish panchmel dal with fresh coriander leaves.